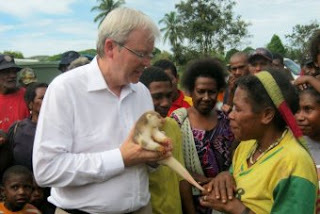 Australian Prime Minister Kevin Rudd's two day visit to PNG will focus on investment and trade issues, particularly a multi-billion dollar gas project. Mr Rudd announced plans to visit PNG saying issues like regional security, heath and aid will be discussed with PNG's Prime Minister Peter O'Neill. Australia's parliamentary secretary for the Pacific, Senator Matt Thistlethwaite, says PNG's multi-billion dollar Liquid Natural Gas project is on the top of that list. "We're working with the Papua New Guinean Government to ensure that they develop a sovereign wealth fund to ensure the proceeds or the benefits of that project are shared amongst the Papua New Guinean population," Mr Thistlethwaite said. Apart from key trade partnerships, Australia and PNG also have a deal regarding asylum seekers. Australia has re-opened detention centres in Nauru and PNG's Manus Island to try and deal with the number of asylum seekers coming to Australia by boat. The PNG site has been criticised by the United Nations High Commission for refugees with its most recent report stating that while there has been some improvement, it fails to meet the terms of a memorandum of understanding between the two nations when it was established. The report highlights poor living conditions and slow processing arrangements as key problems. Mr Thistlethwaite says he doesn't believe the issue will be discussed between Kevin Rudd and Peter O'Neill as PNG is already keen on developing a regional solution with Australia. "Papua New Guinea has shown great support for a regional solution to the issues of people smuggling," Mr Thistlethwaite said. "There has been some constitutional court challenges to processing up there but they've been dismissed. "So, we're really enthused by the commitment that Peter O'Neill and his government has shown to working with Australia on finding a lasting solution, a regional solution to the very difficult issue of people smuggling," he said. Part of the discussions between the two prime ministers will also cover health service concerns in PNG. Dr Curt von Boguslawski, World Vision PNG Country Program Director, says he hopes Mr Rudd's presence will help shine a light on health issues the pacific nation faces. "It has been a hard road to really try and convince the government to do more on health and education," Dr Boguslawski said. "Especially with the health system, there is a lot to be done. Dr Boguslawksi says while funding through AusAID programs has helped improve the health situation of many Papua New Guineans, he would like the organisations providing real services on the ground to be involved in future discussions. "Service delivery is very difficult. It's a rugged country and some of the primary health services are not delivered," Dr Boguslawksi said. "So, malaria and TB are the result of not being able to deliver primary health services and awareness. "Schools, education institutions need to work together to make sure health messages as well as lifestyle messages are passed on," Dr Boguslawski said. Mr Rudd visited Papua New Guinea last year as Foreign Minister and before that in 2007 when he was Prime Minister the first time around.